From Beck and Rihanna, to the Beastie Boys and Atoms for Peace, Sean “Sully” Sullivan has mixed some of the world’s biggest artists. 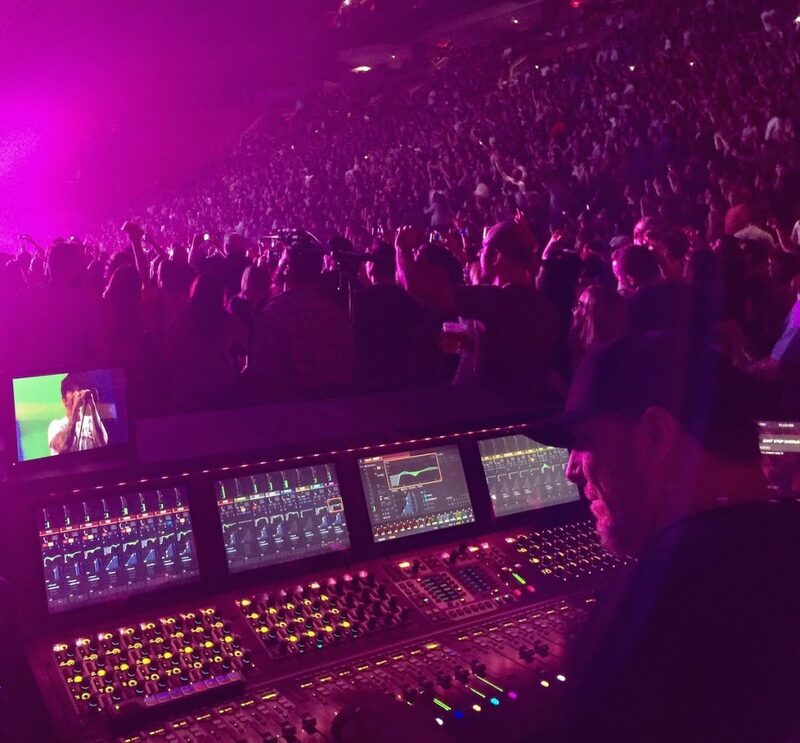 A longtime user of VENUE consoles, Sully recently turned to the Avid VENUE | S6L system when he took over FOH responsibilities for the current Red Hot Chili Peppers world tour. 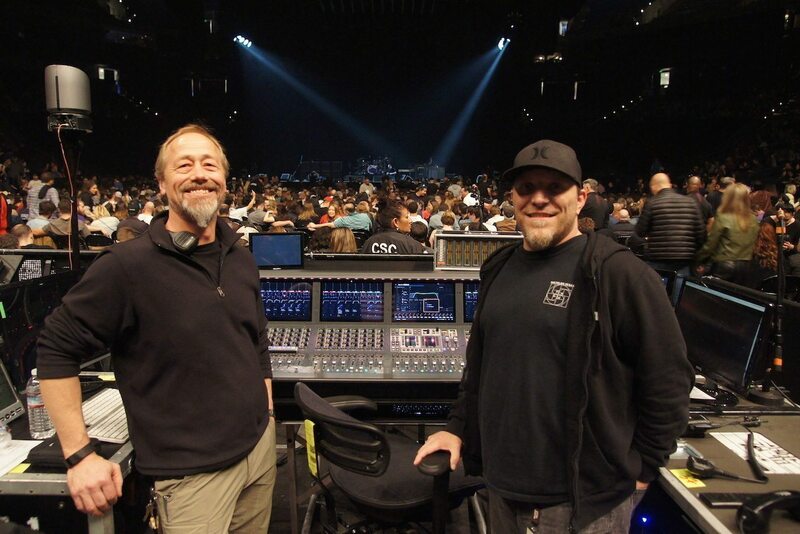 I caught up with Sully at the end of the first leg of the RHCP tour to find out how he was getting on mixing the band on the new system supplied by Rat Sound. DH: What was the process to transition over to S6L from the Profiles that you’ve been using? SS: I borrowed one from the vendor I have been using, Eighth Day Sound. I had a one-off with Rihanna in Abu Dhabi, and a few one-off gigs with Beck. For rehearsals I would load it in my truck and take it to work. 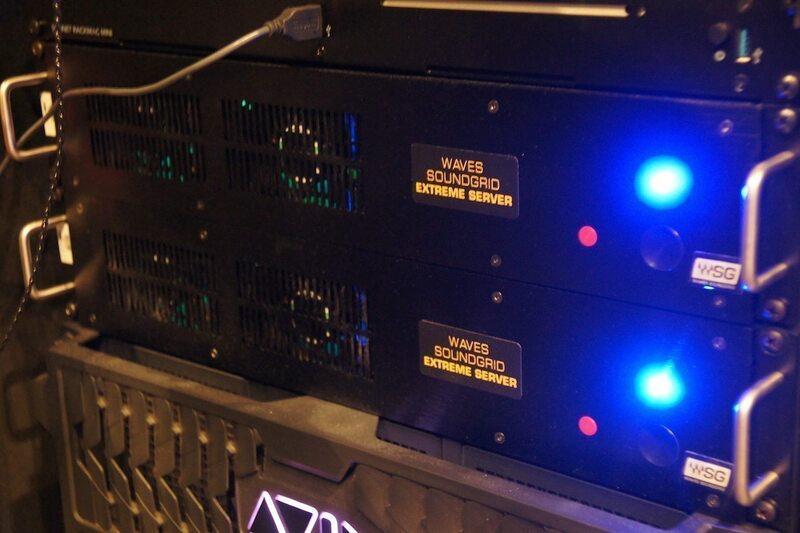 Even though I already had a Profile, I’d split the inputs to the S6L to get recordings with the Stage 64 rack. All I did was track with it, and then I’d take it home and work on my show. 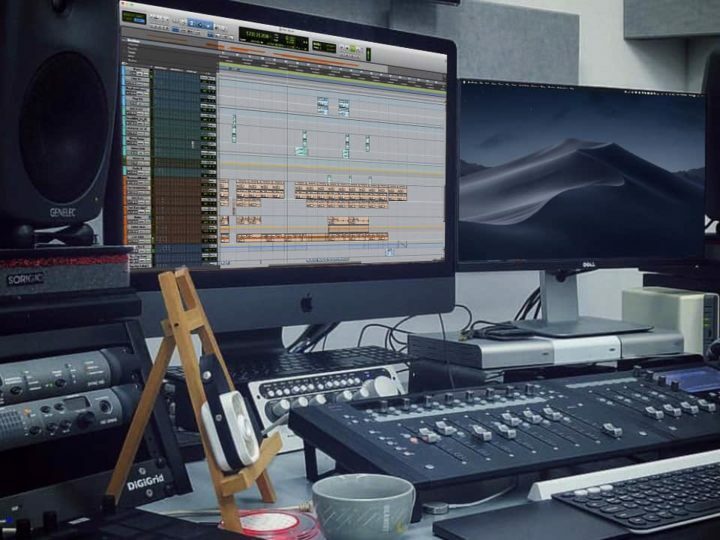 The biggest challenge was which plug-ins to use; I liked using Waves, and with the TDM [format on Profile] it was so easy to use and very nicely integrated that I really didn’t want to go with the SoundGrid MultiRack option, as it’s all external. I don’t like the concept of it not being controlled by the desk—it’s a lot of extra effort to build snapshots, calculate delay compensation, compared to the Profile. So I went out and bought all the AAX DSP bundles, and I figured out what McDSP, Brainworx and Sonnox have to offer; basically tried to figure out how I could get around Waves. As much as I loved Waves, I wasn’t interested in dealing with the current route. Sitting behind it for months at home was more than enough time to get a feel for the basics: layouts, how to navigate internal plug-ins, locating the fine/config/undo/layer buttons. DH: With Beck and Rihanna you’ve got your Profile show files and you’ve got snapshots and all of that. 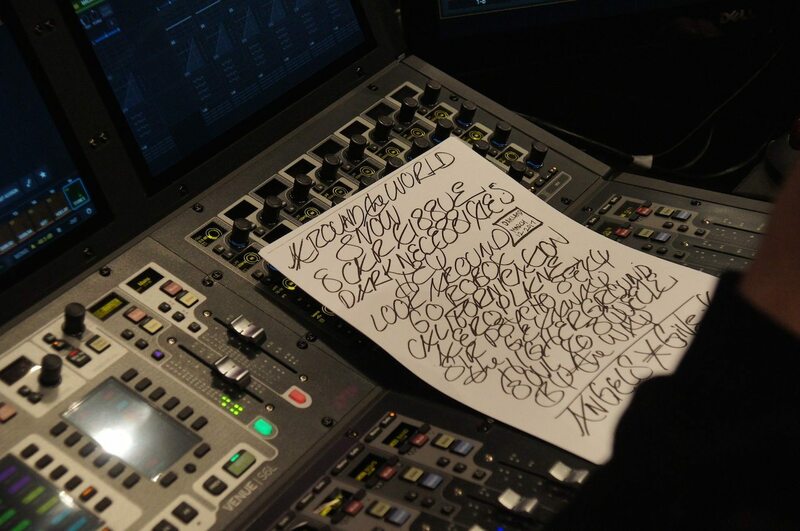 Going into the Chili Peppers tour, how did you approach that, especially since they had previously been mixed on an analog board? SS: They were mixed on an analog console but that didn’t phase me. 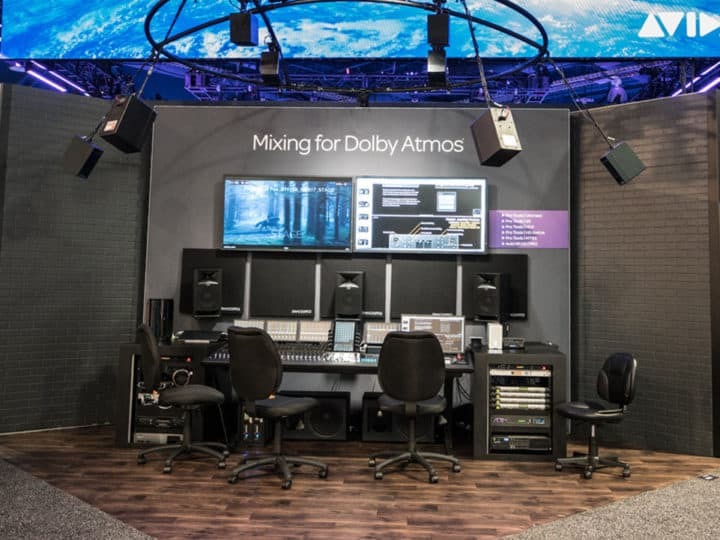 I believe we can achieve much better results with digital due to the options the architecture provides: routing capabilities, snapshots, virtual sound check, dynamics on anything you want… endless possibilities. DH: So in addition to getting the recordings and working on those on your own, did you actually have production rehearsals or did you go straight on tour? SS: No, right into shows. My first time hearing the full band was in front of a crowd. The house lights went off and it was go time. It’s not how I typically like it to go, but since they sent me recordings of shows, the power of Virtual Soundchecking made it easy. I’m actually working on relevant material, relevant musicianship. Although the way I did it with just a Pro Tools session, there was no stage rack involved; the preamps were just set at an arbitrary zero level. If you turn them up or down, then the first time you connect to the stage rack it’ll ask you if want to apply those gain adjustments to the preamps, since I never had preamps connected to this system. It doesn’t know any better. So, my very first line check with the crew, I’m focusing on adjusting the input gains trying to set the input levels to where I remember it was set from the recordings I got. That’s the routine that exists now—recordings and Virtual Sound checking. 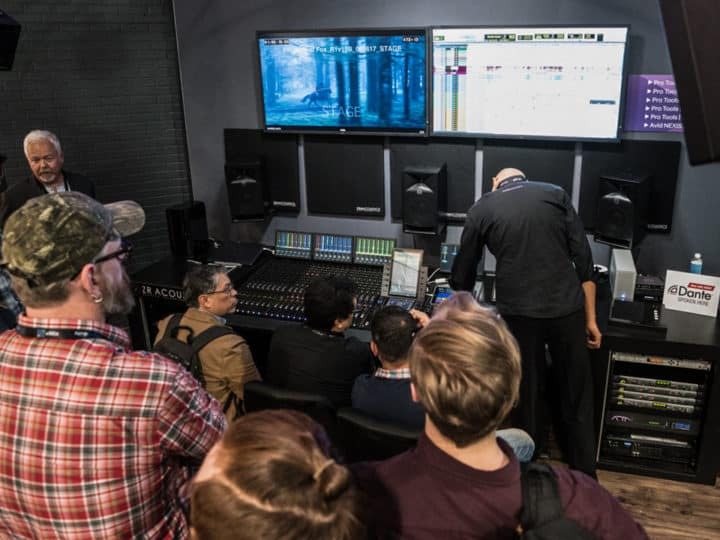 Think about it, we don’t go into the studio and listen to a song for five minutes and go, “Okay, it’s mixed.” You work on them for days, weeks, or months—whatever it takes. And live sound has never been like that until Virtual Sound check came along. 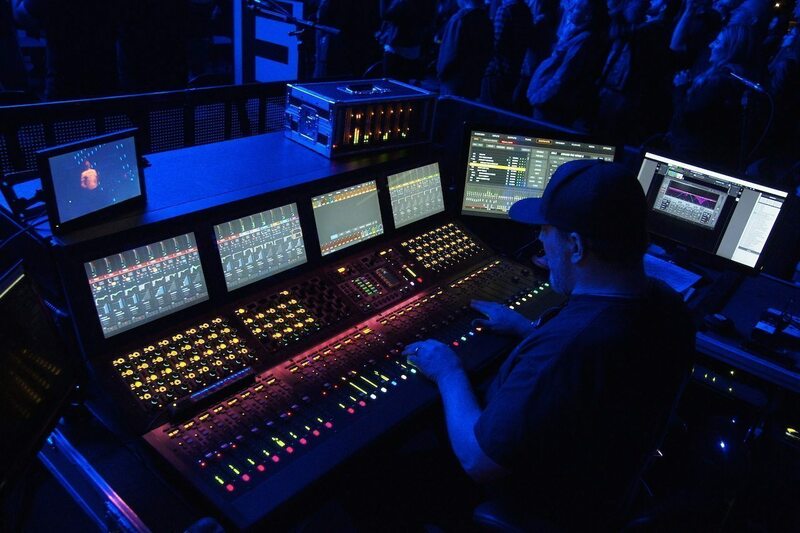 For me it’s the biggest game-changing event in live sound since the beginning. It’s that big of a deal. DH: So once you actually got on tour, did you make tweaks as far as swapping out mics or any of that kind of stuff? SS: Yes I changed some mics—most of the drum kit mics were changed. They had been mic’ing all the snares and rack toms with Shure 98s, which I don’t necessarily mind, but acoustically, what the drums sounded like when you sat there and what they sounded like coming through the mics were not very similar. So we changed the Snare top mics to Heil PR30s instead of 98s and the bottom mics are SM57. Dave’s concept was if the hi-hat gets in the snare mic then keep it simple and don’t mic the hi-hats. I’d rather find a microphone that doesn’t get hi-hat bleed, and mic the hi-hat with its own mic, which they never had. The hi-hat mic we chose is a Heil Handi Pro Plus. DH: I know that Jason Gossman had previously been on Profile handling the broadcast and recording mix. Did you both decide together to move to S6L’s or how did that come about? SS: Jason asked, “You’re using S6L? I’ve wanted to switch an S6L.” The production manager said cool since it was a no-brainer to move him up as well. 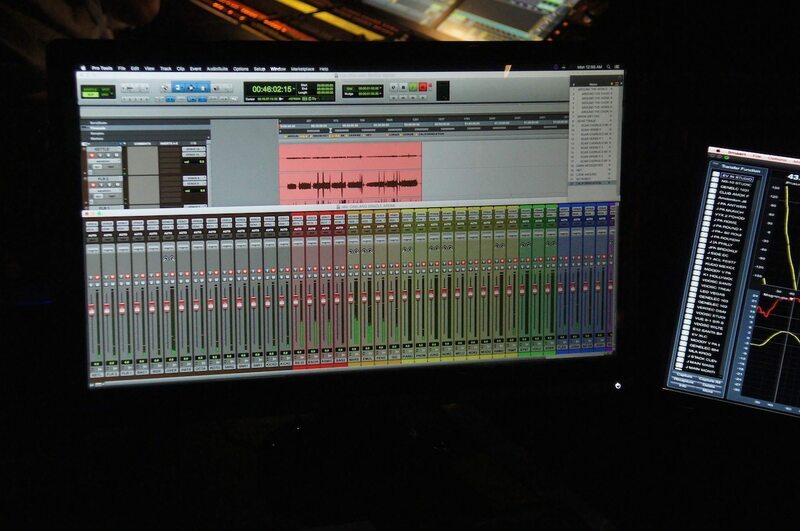 DH: For his recordings, is he using S6L’s Ethernet AVB Pro Tools or an HD MADI interface? SS: He’s using HD MADI from the Stage 64. 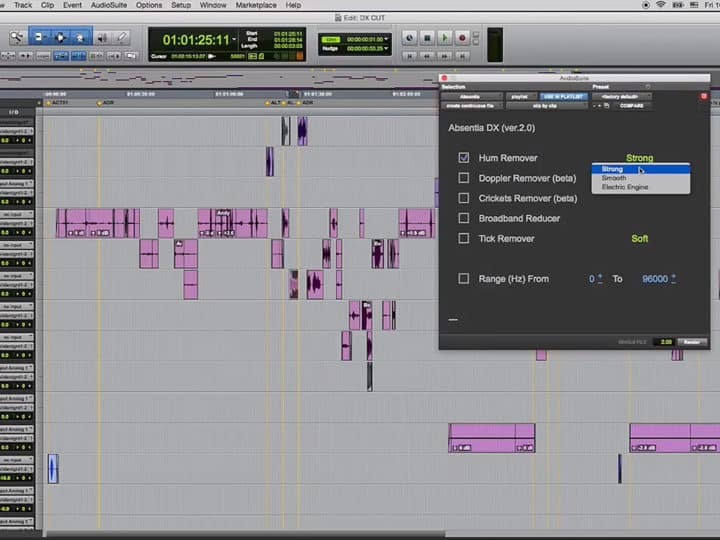 DH: What’s the workflow for him—is he doing some post production stuff as well, or is he just mixing everything on the fly? SS: He works all day long while we’re setting up and line checking. He’s in a room somewhere or just off stage. He’s got a McIntosh amplifier with Proac studio monitors and he’s back there studio style working on everything. He gives them to the drummer, Chad, who approves them. Once approved, they are sent off for upload. They’re sold as MP3s on their website. I had a conversation with him about this the other day. DH: So with Jason handling the official recording, what do you use your board recordings for? SS: Virtual Soundcheck/tuning the PA and a back up for Jason. DH: Getting back to your approach about exploring third party AAX DSP plug-ins, how did you kind of go about it? You’re still using some Waves. How did you decide what you needed that for and where you would find replacements? SS: As much as I didn’t want to deal with Waves being external I couldn’t get away without it, Waves make a lot of amazing plug-ins that I just can’t find something else to cover it. C6 is the first one that I can’t go without. C6 is a bit of a different multiband/dynamic EQ compared to either the Avid Pro Multiband or the [McDSP] AE400/ML4000. Those are not necessarily apples to apples, as far as comparing them goes. Waves just hit it out of the park with C6. It’s one of those deserted island plug-in as far as I’m concerned. No matter what you need to do, you could get away with it with C6. If you want to dynamically boost the low end of your kick drum only when the drum is hit you can do that, then the gate is not needed to keep feedback in check. The boost only happens when needed. 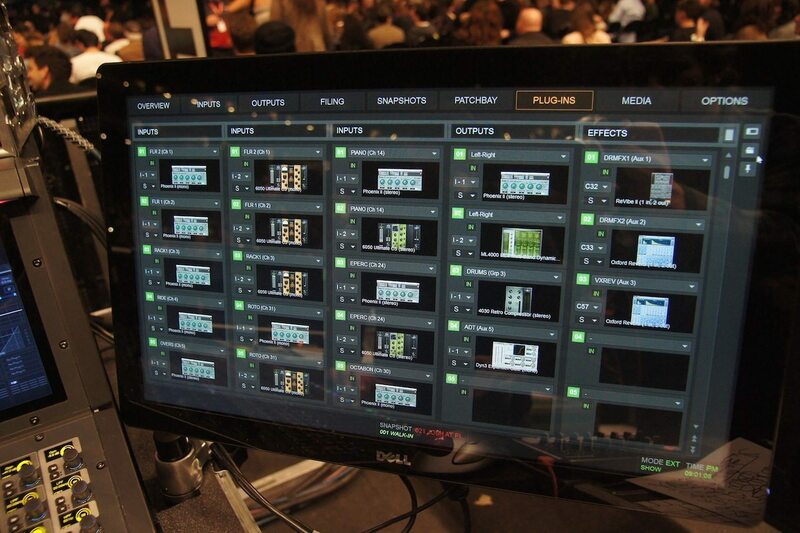 DH: In addition to C6, what onboard plug-ins have you been using–what are the standouts? SS: The console’s built-in channel dynamics. [Laughs]. To be honest with you, I asked myself if I needed a plug-in to do the compression job. When you listen to the stock one [Avid Channel Strip], it does a great job. That’s why when you look at my plug-in rack, a good 90 percent of it is mainly saturation plug-ins [Cranesong Phoenix], and a bunch of the McDSP Ultimate Channel strips that I’m using, I’m not doing a lot of compression in those. It’s simply some other forms of saturation & vintage EQs because they’re simple. The high and low are plain old shelving filters and the mid bands are peaking filters that are fairly wide even when set with a tight Q. I grew up mixing on analog boards, and we never knew what EQ’s looked like, you don’t look at EQs, you listen to EQs. And some of these that I use, like the McDSP Ultimate Channel strip, there is no visual representation of what the EQ looks like. 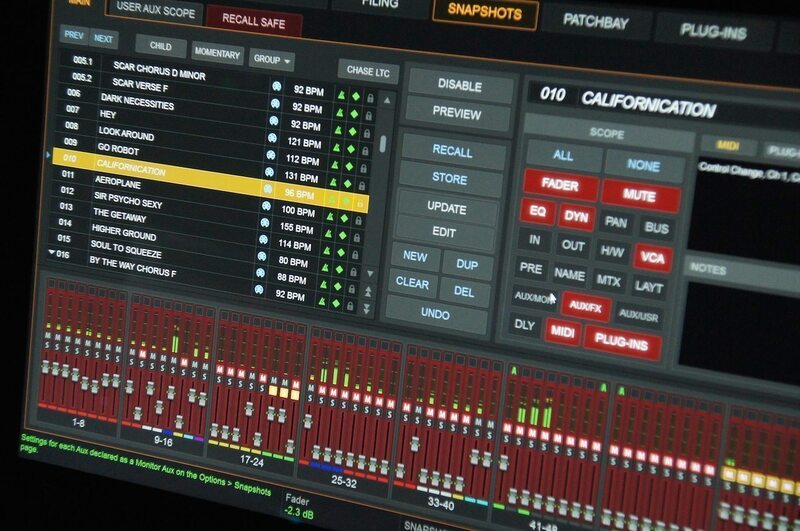 Most of the plug-ins I use do not have a visual representation, just knobs for everything. Never judge things based on looks. The channel might look flat on the desk if you look at my screen, but you can’t see what I’m doing to it elsewhere, and I can’t see what I’m doing to it visually either. I don’t care because it sounds how I want it to sound, that’s all that matters to me. That, to me, is a little bit of a hang-up for digital consoles, and maybe why people have a love/hate relationship with them—because they spend too much time second guessing themselves if something looks drastic or something looks wrong. Who cares? Does it sound right? 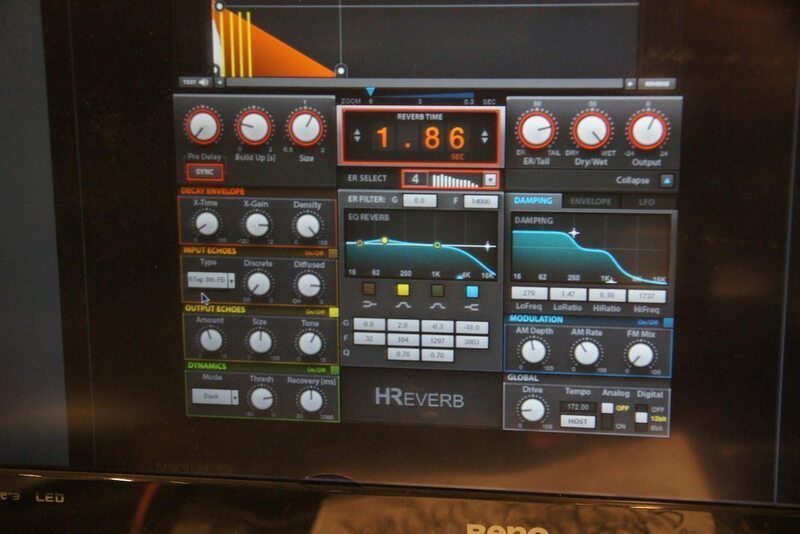 Back to the on-board stuff…Revibe II (Drums), amazing reverb plug-in that a lot of people overlook because it’s basic looking! From the Sonnox bundle, I use the Suppressor DS for de-essing, the Oxford Reverb for certain drum and BGV verbs and Oxford Inflator on some busses.